The good folks at Macromedia have provided me a work-related Blog at MarkMe.com. There is where I'll be geeking out on Dreamweaver features, hints, tips, and Best Practices. I'm sure I'll find a way to syndicate the content here, but for now, keep an eye on my feed. 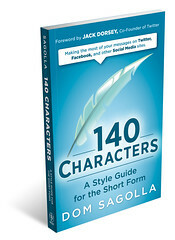 140 Characters is a style guide for the short form, by Dom Sagolla in San Francisco. 140 Characters is a concise field manual that will help you be more effective when communicating in small spaces. Dom helped create Twitter, and iPhoneDevCamp. He's the founder of DollarApp and author of 140 Characters. Dom lives, works , plays, and surfs in San Francisco.